The 2017 Dodge Journey brings a lot to the choice table, including seats for either five- or seven, front-wheel drive or AWD, and two engines to pick from– four or six-cylinder! With all these options, the low MSRP for the Journey really shows the value you get for your dollars. The 2017 Journey has standard in-floor storage for 2nd-row passengers, fold-flat rear seats, and the optional Flip ‘n Stow in-seat storage (front seats) too. The Uconnect 8.4-inch touchscreen keeps all of the infotainment connected along the way this year as well. Leather seats and a premium 368-watt sound system (w/subwoofer) appear within the GT model, which is new this year and helps refresh the prior model lineup. There are new paint colors for 2017: either Spitfire Orange or Rhino (gray). The Crossroad model gains a Satin Carbon wheel finish to add to its already handsome appearance. The 2017 Dodge Journey comes with a 2.4-L 16-valve DOHC (4-cylinder) engine as standard, which makes 173 horsepower and churns up 166 lb-ft of torque. There is an available AWD system that corrals power to the front wheels to conserve fuel, but then lets it out to the rear wheels too, as necessary. The Crossroad models, as well as the SXT, can opt for the 3.6-L V-6 Pentastar engine, which brings in 283-horsepower and 260 lb-ft of torque (standard on AWD models & the GT). The 2.4-liter engine is partnered with the 4-speed automatic transmission. The GT trim uses a high-performance suspension and the 6-speed automatic. The 2017 Dodge Journey brings so many selection possibilities to the owner, it can almost be hard to keep up. The Uconnect 8.4-inch touchscreen (with 4 distinct model choices) is on the list for 2017, as well as are audio controls on the steering wheel, and standard Keyless Enter ‘n Go with a push-button start. The 2017 Journey enlists five models: the Crossroad Plus, Crossroad, SXT, GT, and the SE. On the SXT model, front-passenger Flip ‘n Stow in-seat storage is an election, another unique example of the Dodge Journey’s continuing value. On the GT and Crossroad Plus models, there is an available Rear-seat Video Group I, which has a video remote control, wireless headphones, an excellent sound system, and a second-row 9-inch video screen! The GT trim brings as standard a monochromatic exterior, leather seats with red accent stitching, a heated steering wheel, and 19-inch ‘Satin Carbon’ aluminum wheels. Compatible child booster seats can be fit to the reclining second-row seats (available). Drivers can pick third-row seating on any model. Backseats fold for more cargo space, and removable storage bins are on the floor, in front of the 2nd-row seats! Journey rocks the style department a little with intentionally sculpted lines and the signature Dodge “split crosshair” grille. Brazen “ring of fire” LED tail lamps are on the back (and make keeping track of you easier when friends are following you)! We are located at 15711 Gulf Freeway Webster, TX 77598. Yes! It has blackened roof rails, fascia applique, grille, 19-inch aluminum wheels, and Gloss Black exterior mirrors. It is an option on both the SXT and GT models. Safety first, and kid’s safety is utmost in Dodge’s design within the Journey. The LATCH child seat anchor system is standard on all models. The safety features seen in the 2017 Journey are multi-stage front passenger airbags, active head restraints, electronic stability control with all-speed traction control, side-curtain airbags for all 3 rows, brake assist, front seat-mounted side airbags, electronic roll mitigation, and a driver-side knee blocker airbag. There is a trailer-sway control on all 2017 Journeys, plus, the always-handy remote keyless entry. Drivers can opt for certain packages to install a rear parking assist, a rearview backup camera, and/or a security alarm. 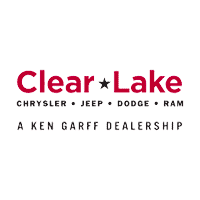 Clear Lake Chrysler Jeep Dodge is ready to take your calls about a 2017 Journey at (877) 720-5808 anytime we’re open!